MPC’s Two-Part Asset Tags distinctly mark office equipment and furniture. The second tab conveniently attaches to your records, thereby increasing efficiency and reducing errors from manual recording. Constructed of a 2.0 mil gloss white polyester face stock and top laminated with a 1.0 mil clear polyester film. The 0.8 mil high-performance permanent pressure-sensitive adhesive offers high initial tack, and permanently bonds to high- and low-surface energy plastics, slightly textured and contoured surfaces. 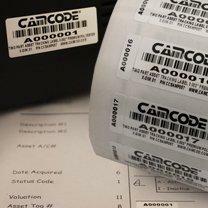 Why choose MPC’s Two-Part Asset Tags? Second tab attaches to records, increasing efficiency and reducing errors. High contrast for easy readability; color available. 1.75" x .75" w/0.25” tab. See price list for color options and part numbers. Custom sizes available.